Dinner menu tasting at Bistro Wagon Rouge on Powell Street in Grandview-Woodland on February 6, 2014. Grandview-Woodland and Hastings-Sunrise, collectively the East Village Vancouver, is still somewhat of a hidden gem of independent businesses, restaurant, craft breweries, and artisans. 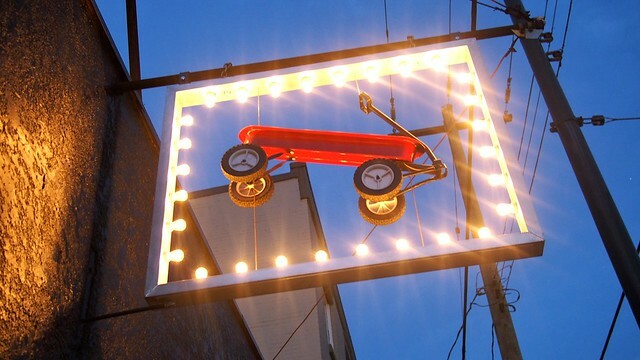 Opening in November, the team behind the ridiculously popular Red Wagon Cafe have quickly established their offshoot Bistro Wagon Rouge, a small diner like eatery based on fine French cuisine, as a go-to destination in the area. 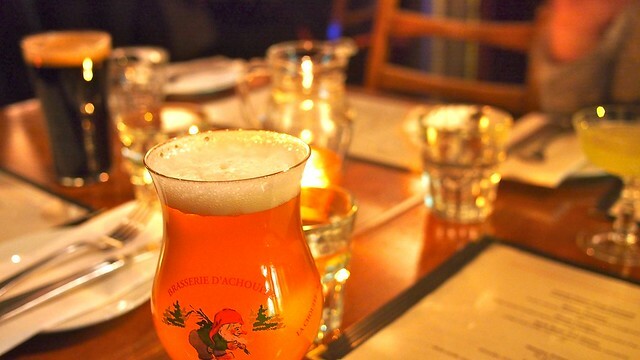 For libations, I enjoyed a La Chouffe beer on tap as well as a Wagon Rouge cocktail (with gin and lavender lemonade). 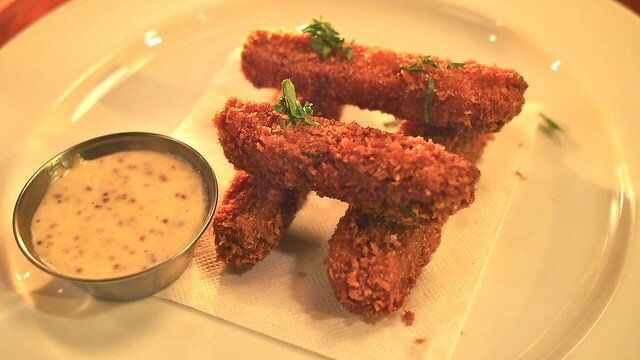 On our tasting, we started off with some of the trademark deep fried pâté fingers, quite delicious, deadly so. Their two chalk board feature menus of breads, cheeses, and mains change and rotate daily so your experience is sure to never be the same. I definitely recommend any of the bread slices topped with pâté or meat spreads. 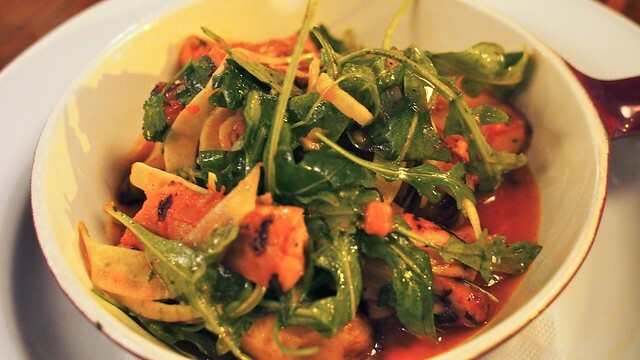 We were told the grilled octopus (with fingerling potatoes, chermoula, fennel, and arugula salad) was a must try and its flavourful combination did not disappoint as a mishmash of diverse flavours. 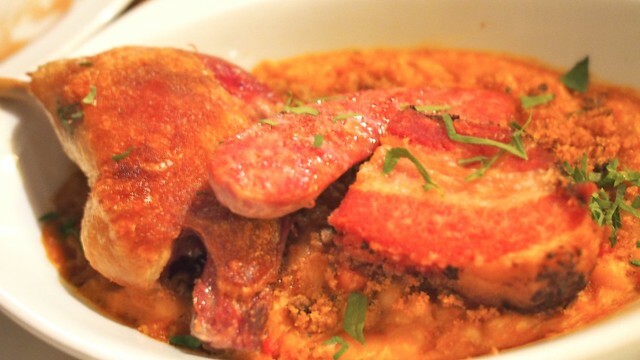 I greatly enjoyed the composition and combination of tastes in the cassoulet duck confit (with house made Toulouse sausage, crispy pork belly, and braised beans) full of contrasting meat tastes as a hearty, filling main served as a slow-cooked casserole. 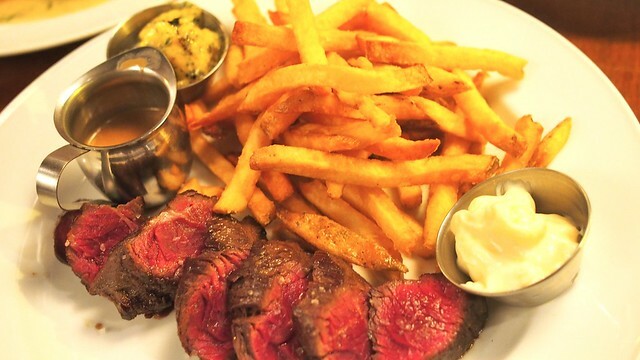 The staple of steak frites (hanger steak with peppercorn sauce and café de Paris butter) was a superbly cooked highlight, done just right. As for seafood, the ling cod (with chowder, mussels, clams, and brandade croquette) was a delightful smörgåsbord of flavours. The beef cheek bourguignon was well prepared, but not as intriguing or mighty in taste as the other plats principaux. It was a little plain for my tastes. For dessert, I heartily recommend the butterscotch pot-de-crème (with shortbread crumble) and the simple financier cake. 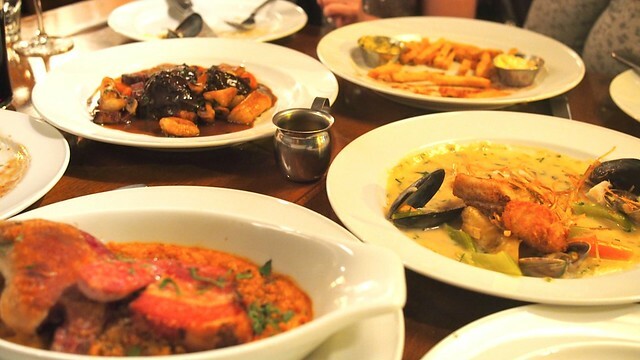 BWR offered a plethora of great French cuisine in a charming environment despite just opening. It's a very small, intimate space with minimal seating but a enticing bar setup. I suggest you get there before 6pm or after 8pm to snag a table. I eat there at least 3 time a week . My favored dishes are #13-28-42 and 47. Bon apetit.